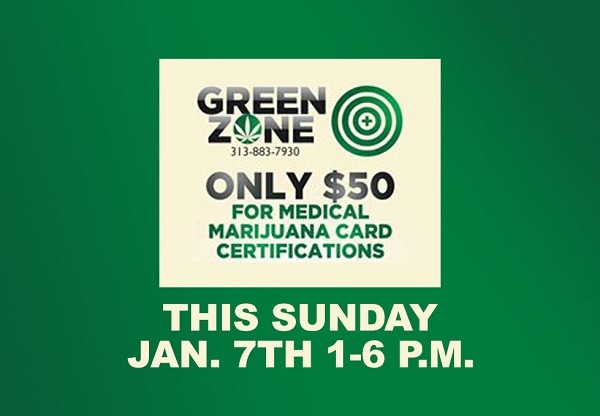 This Sunday, January 7th, from 1 p.m. to 6 p.m. Green Zone Center in Detroit says they will be offering medical marijuana card certifications for only 50 dollars. Normally costing nearly 100 dollars, they say this is the lowest price for certification in the state of Michigan. Green Zone says anyone interested and eligible can come to the dispensary during this time and speak with a qualified doctor in order to become certified. After purchasing a 50 dollar certification, interested parties will need to pay a 60 dollar state fee as well to obtain a medical marijuana card. Green Zone says during the event they will be offering free pizza and refreshments. Along with this, they say all first time customers will receive a free top shelf pre roll. Appointments for this event can be made by calling 313-883-7930, but walk-ins are also welcome. Green Zone is located at 12032 Rosa Parks Blvd., Detroit, MI 48206.